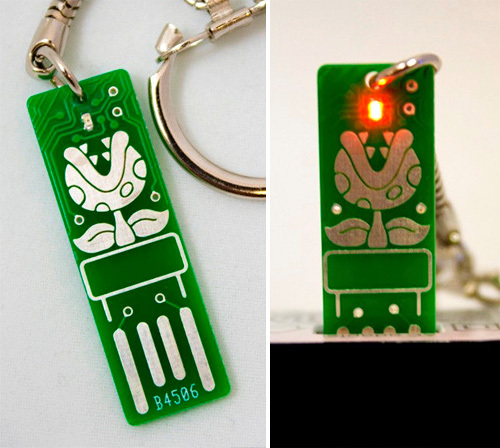 Light Up Piranha Plant USB Circuit Board Keychain | OhGizmo! Normally I’m put off by pointless trinkets and crapcessories that connect to a USB port just to draw power. Like miniature desk fans and the like. But for some reason this circuit board keychain doesn’t set off the angry center in my brain. One side features a “field of traces and techno glory” while the other features one of Mario’s longtime foes- a piranha plant. And it’s an old-school piranha plant too since when plugged in to a USB port it spits a fireball. Something not seen in Super Mario titles for a few years now. But as features go that’s pretty much it. There’s no built-in flash memory, no battery to power the red LED when it’s not plugged in, nothing. And that’s probably why they’re available from Etsy seller ‘Boardaments‘ for just $9.99 each.